Melissa at The Inspired Room hosted Creative Inspiration Week this week. 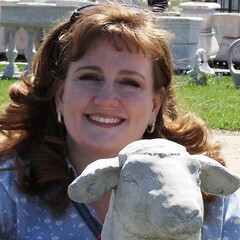 She had so many wonderful guest hosts who shared the wonderful creative ideas. After absorbing the creativity oozing from the ladies at McMaster & Storm, I was inspired to see what I might be able to do with tissue paper. This gift is for my sweet husband. I won't tell you what's hiding beneath the roses, in case he peaks at my blog! I had a lot of space to fill in this package, so the gift wouldn't rattle around ,so I decided to squeeze in a dozen roses. 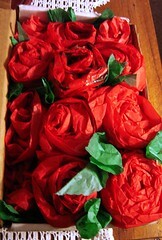 The roses are made with pleated & rolled up red tissue paper. The leaves are just torn scraps of green tissue paper, tucked in between the roses. One rose (middle of second row from top) is red paper with Christmas trees...just for fun. I wrapped the package the traditional way, but I think my husband will be surprised at the special interior of the gift! Thanks for sharing, Kara & Darcy! very cute and well done, thank you for sharing! That is so, so so special! Love this! Thank you, ladies! I had fun with it, and am looking forward to trying it on some more packages! I think the roses would be great for Valentine's, too! That is great! Thank you so much for sharing what Kara and Darcy did for Creative Inspiration Week! I just now am finding your post, so I wanted to come by and thank you personally! And I am so glad you posted about this, because now I have found you! 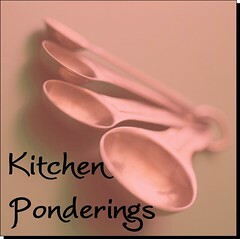 And your blog title "Pondered in My Heart" caught my attention, I just wrote a bit on that topic today! It was a very happy moment for me to click over and find your blog.